What happens when you mix salt and ice? During these cold winter days it can sometimes be difficult to get outside, so why not bring some of the winter elements indoors! 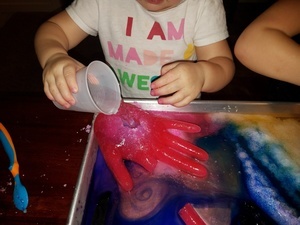 These melting hands are not only a learning experiment; they’re also fun and colorful. Of course you could freeze some water in anything you have at home, but the rubber gloves make for some extra giggles. The idea behind this is to see how quickly salt can melt ice. 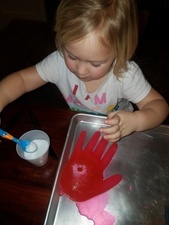 To recreate this melting hand experiment all you need to do is freeze some water in a rubber glove. Add some food coloring if you want to make them extra colorful. When the water is frozen solid, carefully cut the gloves off. Gather some tools, like plastic utensils and paintbrushes. You can use whatever you want! Add some salt on the ice. Notice how the ice becomes weak in those spots. It's also fun to watch the salt turn colors! Use your tools to carve at the ice and take note of how long the salt takes to melt. To add an extra element, freeze some small marbles in the gloves. Use the salt to try and thaw and remove the marbles!